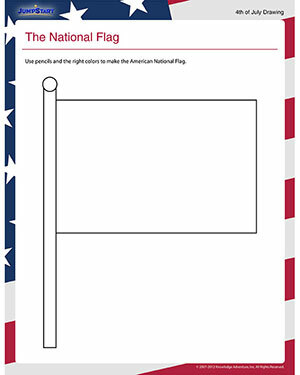 ‘The National Flag’ is a free and printable drawing worksheet that will help kids in kindergarten learn about our national flag. Arm them with pencils, rulers, and the right colors to help bring out the little patriots in them. This Independence Day worksheet is a great introduction to American history for kindergarteners. Start their historical education early and make it fun with the help of this free and engaging 4th of July worksheet for kindergarten.